How was the food they offer? : Plenty of coffee, which was the most important to us. My review:	Jorge is a great host. He helped me a lot with my Havana and Cuba sightseeing organization. He has a lot of friends all around the island so he is full of great ideas and good information for traveling when staying on Cuba. Jorge was very kind and always ready to help. He lives in Vedado near the coast, Malecon road. His place is also near the centre of Havana. I liked that the house was placed in a calm and quiet neighborhood. He also has a housemaid living with him. She prepared breakfast for us every morning. I loved breakfast there. The table was loaded with fruit and other food. Because Jorge is a professional masseur we could also get a massage and sometimes it felt great after a long day. How was your room? : My room was big and cozy. The furniture was in colonial style. It was very romantic. The double bed was perfect. There was also air-conditioning and private bathroom. How was the food they offer? : Fantastic. There was a lot to choose from. It was very tasty, we loved that it was fresh. Other services they offer: Massage, Laundry... The staff was very kind and made the staying very pleasant. 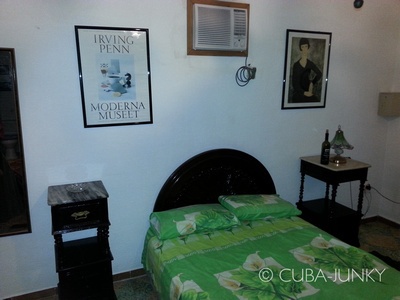 Other comments: I would recommend this casa to anyone who wants to see all that Cuba has to offer. We had a fantastic time there and would go back without a doubt. 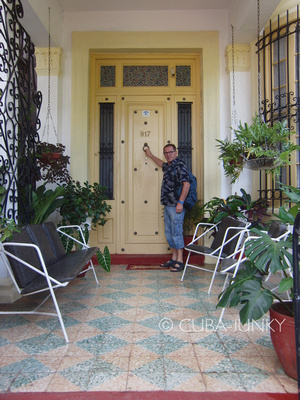 My review: We stayed 18 days at Casa Blanca and it was a beautiful and peaceful oasis in the quiet neighbourhood of Vedado, a few kilometres off Habana Vieja. It is a special, distinct, classy colonial house with lots of antique. There is a lovely porch and a cultivated green garden; we even got to see a real hummingbird because of the flowers....in the middle of town! How was your room? : The room is fine, the bathroom is fine and we could use the balcony to sit outside. How was the food they offer? : The food was perfect; Always fresh fruit and a big glass of guave juice. Bread, butter, eggs, sausages, guavemarmelade. Coffee and milk. More than enough to start a day! Other services they offer: Because of our lousy Spanish we were very glad to get in touch with an English speaking owner who was very willing to tell and advise us everything we wanted to know or do! He knows (almost) everything and is a perfect host and great storyteller! We had a really good time together and felt casa blanca as a real home! My review: Casa espectacular situada numa zona muito calma do Vedado-Havana.Casa sempre muito limpa e confortavel com ar condicionado,tv lcd e bom mobiliario. O dono Jorge Duany é uma pessoa muito prestável atenciosa e afável sempre disponivel para ajudar quando necessário. Recomendo a 100% para quem queira passar umas férias de sonho em Havana. How was your room? : Sempre muito limpo e arrumado. Aempregada Cecilia é muito cuidadosa. How was the food they offer? : Só tomei um dia o pequeno almoço na casa mas estava muito bom. My review: This casa particular is an extraordinary place and definitely a must-go while staying in Havana. We spent 4 days in total there, really enjoying our time there. The owner Jorge was an extremely nice and welcoming host, always helpful and made our stay very special. The clean and quiet villa is built in colonial style. Guests can also have a yummy breakfast including fruits, eggs, pancakes, bread, coffee and juice. Location-wise the casa is the best of both worlds: with local cabs (all the old american cars) you can go to central Havana just for 0,5 CUC in about 15 minutes. But you are also near to Vedados nightlife area, including bars and restaurands. If you want to relax after a long day in the city you also have a beautiful sunny terrace/balcony to enjoy a cold beer and relax.Next time we visit Havana, we will stay again at Casa Blanca, Vedado. How was your room? : Rooms are cozy and very clean, equipped with AC, fan and TV. After 2 days even the sheets and towels were changed! How was the food they offer? : The breakfast was rich and delicious! Other services they offer: Lots of travel tips for Havana! Other comments: Don't miss this gem! My review: My fiance and I spent 2 wonderful nights at Casa Blanca. Jorge is the perfect host going above and beyond to make you feel welcome in his home city. He gave us wonderful recommendations of places to eat and sight see when in Havana. 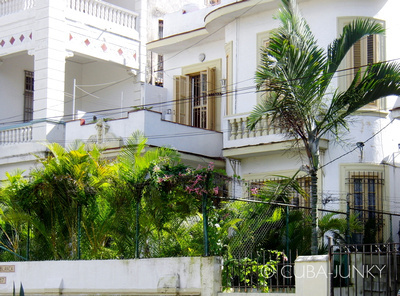 Casa Blanca is a beautiful colonial house suited in a quiet neighbourhood. Our room was very comfortable and we slept very well. The breakfast was delicious with a big choice including fresh seasonal fruit. We never needed lunch after such a huge breakfast. We had a wonderful time and will definitely be staying at Casa Blanca when we're next in Havana! How was the food they offer? : There was an enormous choice for breakfast and every day we were totally stuffed! The food was delicious and my personal favourite was the fresh local fruit. exceptional few times in my life I have met people like that! How was your room? : The rooms are spacious and very comfortable, equipped with every comfort. do yourself the Coktel, they're good. My review: Our stay at Casa Blanca unforgettably delightful.We have been to Cuba many times and without any doubt the Casa Blanca experience left an impression unmatched by any resort or hotel at which we have previously stayed.The friendly staff and ambience inside this beautiful colonial mansion has ensured that we will be repeat guests. The proprietor Jorge Duany was beyond helpful in making our stay one of the best vacations we have ever had. Other services they offer: Jorge was incredibly knowledgeable and helpful as a guide in directing us to the best sights and entertainment in Havana. He is also an experienced massage therapist. My review: My stay at Casa Blanca was wonderful! 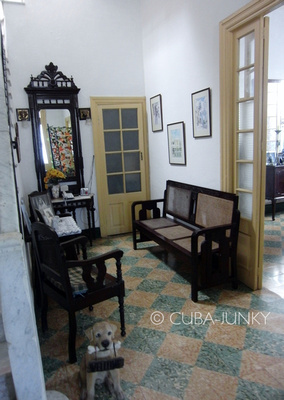 The setting is beautiful, the location is convenient to downtown Havana, and the owner is absolutely fantastic! He speaks fluent English and will do anything to make your stay enjoyable. How was your room? : The room was air-conditioned, quaint, and comfortable. How was the food they offer? : The breakfast was delicious, lots of fresh fruit. How was the food they offer? : Good breakfast but not a lot to drink. My review: Muy buena ubicación en el centro. La limpieza es excelente y todos los detalles están muy bien cuidados. Estilo colonial y su gerente el sr Duany se ocupa de que usted se sienta como en casa. La comida es muy elaborada por un chef que te hace viajar con sus platos por toda la isla. Una única sugerencia es intentar ampliar la zona de aparcamiento de la casa. La seguridad es otro de sus valores. Sin duda repetiremos y la recomendaremos a nuestros amigos. How was the food they offer? : Comida típica cubana. Other services they offer: Lavandería. Fregar coche. Guías. 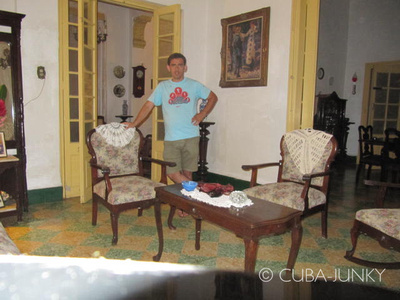 My review: I really enjoyed my stay in Casa Blanca , I stayed for more than 15 days, Jorge the owner is very helpful he will give a lot of advise about Havana and cecei the care taker is a wonderful person , I am grateful that i found this casa, cant ask for anything more. How was your room? : Nice very large room with queen size bed and private hot water shower. Comfortable bed and air conditioning available. How was the food they offer? : A good breakfast is offered at a convenient time of your choice. We also had an outstanding dinner of local food offered by the host for New Year. Other services they offer: Multilingual host helped to find accommodation in other cities of Cuba, recommended places to visit, explained the most economical way to travel around and walk us to some amazing restaurant in the surroundings. My review: A wonderful place to visit Havana and enjoy the visit. Very good location, adequate comforts, far above the standards at a typical "casa particular". But the main advantage is the host himself - Jorge. Most helpful, knowledgable, willing to assist, friendly - just the guy you need in Havana. One potential problem, Casa Blanca is in quiet, pleasant neighborhood, not far from Malecon, but if you want to go to Old Havana, you need a taxi. This is best arranged through Jorge, he knows all the tricks. All in all, I highly recommend Casa Blanca, believe me, try it and you'll not be disappointed. How was your room? :	Rooms are clean, we'll equipped, an have a small bathroom (each separately). All necessary equipment is there, and all rooms are air conditioned. How was the food they offer? : Basic breakfast, OK. On top of this you can arrange a snack, but there is no restaurant in house. But there are several places to eat in the neighborhood. Other services they offer: All kind of helpful and friendly assistance. My review: We loved staying at Casa Blanca. It is a beautiful, well maintained house, close to everything that you need in Vedado. Jorge is a fabulous host who speaks english well. He invited us for New Year's dinner with his family which was a highlight of our vacation. 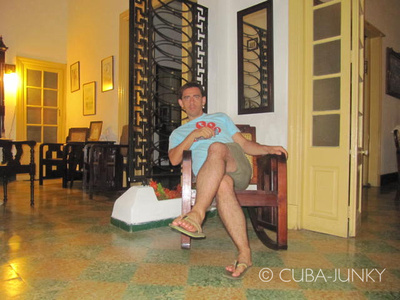 If you want a real cuban experience in Havana, and want a great place to stay, Casa Blanca is the place. How was your room? : The bedrooms were large, with high ceilings. Very clean and breezy. How was the food they offer? : Breakfast each day was huge with lots of fruit, eggs, sausage, rolls, and juice. Other services they offer: Jorge is a great resource who will help you get tickets to shows, events and transportation. He was able to suggest many good restaurants. Other comments: We went to a local hotel a few days to use the pool, and went twice to the beach which is only 45 minutes from the casa. Otherwise we explored Havana in all of its amazing glory. Musicians everywhere were outstanding. My review: Casa se nalazi u mirnom rezidencijalom dijelu Havane, a samo 10 minuta ugodne šetnje sjenovitim ulicama do Malecon-a, odnosno do hotela Melia Cohiba gdje se može koristiti internet veza kao i svi ostali sadržaji. Stara Havana je taksijem na istoj vremenskoj distanci. (Preporu?amo da koristite "caro americano" kao prijevoz jer je deset puta jeftiniji od službenog taksija. Vlasnik ku?e - Jorge - je jedna vrlo ljubazna i educirana osoba koja svim svojim gostima posveti dovoljno vremena da ih uputi u sve atrakcije glavnog grada te da im pomogne prakti?nim savjetima, pogotovo korisnim onima koji na Kubu dolaze prvi put. Ku?a je kolonijalnog stila, a isto tako je ure?en i njen interijer kompletno opremljen ukusnim stilskim namještajem. How was your room? : Soba je vrlo prostrana s visokim stropom tipi?nim za kolonijalne zgrade. Krevet je dovoljno prostran za dvije osobe i udoban za spavanje; ?isto?a na zavidnom nivou. Kupatilo se nalazi u hodniku na svega par koraka od sobe, ali je prostrano i rezervirano samo za tu sobu. How was the food they offer? :	Doru?ak je vrlo bogat i može se stvarno dobiti sve što se ina?e poslužuje u hotelima. Primjerice: zatražio sam od Jorge-a da mi pripremi pala?inke kojih, ina?e, nije imao na jelovniku, a on je smjesta pronašao recept i odmah ih pripremio. Other services they offer: Ako ne?ega nema u standardnoj ponudi uvjeren sam da ?e se Jorge potruditi da vam uvijek pomogne. Other comments: Preporu?am ovu ku?u. My review: Perfect stay, very clean and friendly. Old but well kept colonial building. Very friendly and helpful owner. We felt like home from the first moment. If we knew ealier we would have liked to stay much longer. So it was only for our last night in Havana after a 3.5 week trip. But It was the best we had and with Jorge, we found the best host in Hana. Definitely a must stay if you are there. How was the food they offer? :	Delicous Breakfast! 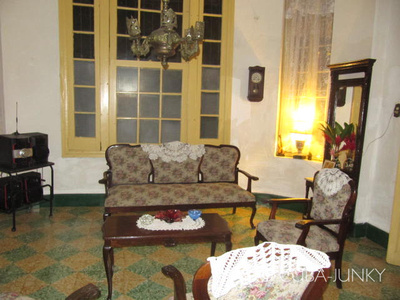 Casa Blanca is a nice house, colonial style 1920. the house is very spacious and very clearly. The house has two floors. On the second floor is the bedrooms and bathrooms. also has a terrace where you sit down for a chat and a drink, especially at night. 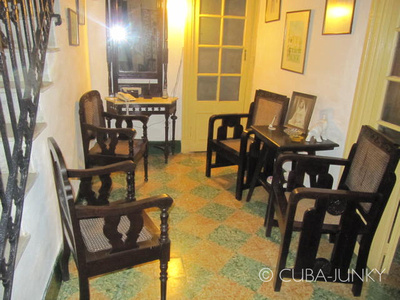 Other comments:	Casa Blanca is located in the Vedado - Havana, close to the old havana and famous malecon havana .